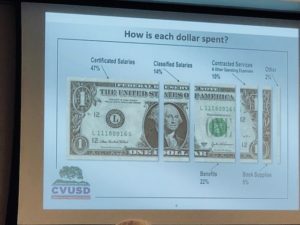 (Thousand Oaks, Ca) With its usual start time at 6pm, the CVUSD board meeting brought in students from each of the district high schools who provided updates on their respective school’s year so far. Nick Capobianco, of Century Academy, shared that they had just completed their Back to School night and the many upcoming events on schedule this year. Joe Cardenas, of Conejo Valley High School, provided an update that his school didn’t start until September 12 and they would be having a blood drive on November 9 and outdoor school on November 14. He also mentioned there would be ice breakers every Wednesday at Conejo Valley high School to help students get to know each other better. Audrey Washington, of Newbury Park High School, shared that her school welcomed 17 new staff and that the League of Women Voters would be on campus registering people to vote. Haley Dulgrin, of Thousand Oaks High School, mentioned that the students appreciated receiving their new air conditioning system, the school library remodel, and their new chrome books. Dulgrin also mentioned a college fair on September 24. Scott Pugh, of Westlake High School, shared that his school had a “wow” orientation week. Pugh explained that students were able to participate in a class spirit program called “5 star students” where points are accumulated over the school year through participation events validated through the app similar to “Hogwarts.” Pugh also shared that on Saturday, September 15, people could participate in an event to benefit the Children’s ICU in Loma Linda. After the student updates, local councils committees, and organization provided updates. Rocky Capobianco, from the Conejo Council PTA, stated that it was a busy time working to invite parents to participate. He shared that there was now a “council platinum membership” to help raise funds from those able to donate more. Capbianco also shared that the PTA has scheduled a forum for school board candidates to debate. He stated that each candidates received a certified letter and had to RSVP by September 1 to participate. Of the 8 candidates, two would not be participating. Jenny Fitzgerald had a family commitment that she could not move and would be sending a representative to read an opening statement on her behalf, and Dr. Amy Chen did not respond. Capobianco reiterated that the PTA does not take a position on candidates in elections but rather on policies. 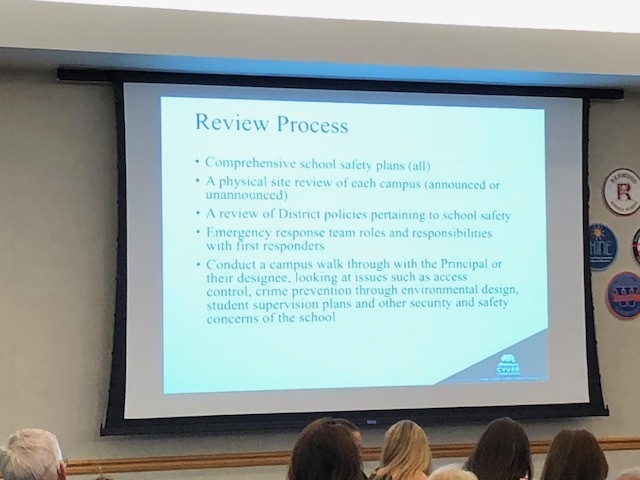 Capobianco also shared a program called “Project Conejo safe homes,” a collaborative effort that asks parents not to serve alcohol at school gatherings and asks their commitment to be present during events at home. On November 10, The Teen Center will be hosting health screenings for cardiac anomalies for free. Cindy Goldberg presented on behalf of the Conejo Schools Foundation. Michael Soules, CSF President, was supposed to make the presentation but was traveling to Dubai. Goldberg stated that the “Get Ahead” Summer School program enrolled 800 students this summer with 90 scholarships being granted. On September 21, CSF would be participating in Charity Karaoke at Borderline Bar and Grill. Goldberg also shared that on October 11, CSF would host “The State of the School”at CLU, a presentation by the Superintendent to the public. Goldberg also handled the next presentation on behalf of the District Advisory Council (DAC). She shared that the Tuesday morning meeting included a presentation by office managers on Measure I updates. She also conveyed that the new volunteer policy is a hot topic. Chloe Nash Vice Chair of the Thousand Oaks Youth Commission, presented the Youth Summit plan which takes place in even years. The event is organized to help high school students provide information back to the District on information important to the students. This summer, the event was attended by Dr. McLaughlin, Mike Dunn, and Dr. Betsy Connolly. Some of the feedback from the event included the request for increased help for high school seniors and how to get into dream schools and some suggestions for help on mental health. Nash shared they have multiple social media pages and requested people follow the group on any of several social media platforms. The meeting then shifted from presenters from the audience to presentations by district staff. 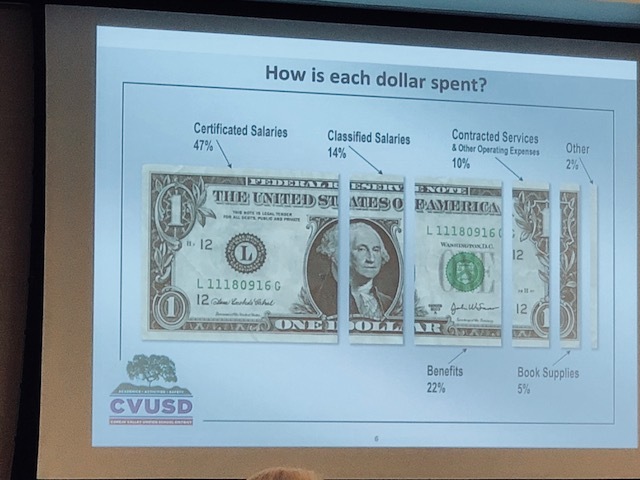 Item 2H on the agenda was focused on an analysis from a 3rd party company after a security audit was performed at every school within CVUSD. 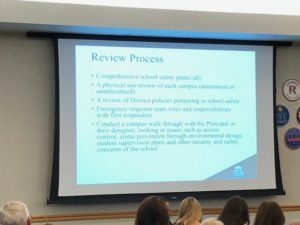 The district contracted with The National School Safety Center. On June 2018 findings were presented and the district was communicating with principals to implement strategies. Principals received their own and other school analyses. 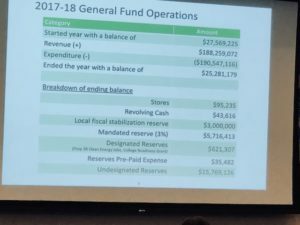 After the presentation was complete, Mike Dunn asked for clarification and re-statement on what resources local school have from sworn peace officers. The response was that the Thousand Oaks Police Department is contracted to be on campus at all schools. These are sworn peace officers with guns. After this presentation, the agenda shifted to public comments with 9 speakers. The first speaker was Bill Gorback who addressed the district bullying policy. Gorback discussed the agenda item on cyberbullying and stated his belief that there should be more emphasis placed on emotional well being of students. He suggested adding more counselors for emotional support so that there could be more focus on proactively implementing LCAP 4. Leanne Holland, of Thrive Conejo, stated that on Thursday, September 27 at 5:30pm at CLU their organization would host a debate for school board candidates. She also added that she was happy the special education district advisory council was added back. The next speaker, Karen Meyer, read comments on behalf of someone else. Meyer addressed district changes to policy and schedules of classified employees. Her comments included the conclusion that productivity is an issue because of the manner in which time is no longer flexible for taking portion of lunch breaks to leave early for appointments and other personal commitments. The new policy forces that a person that leave early use personal time or lose the time. She stated that inflexibility is unproductive and several district employees feel this way. Ron Meyer came to the podium next to address the change in work time for classified employees. He stated that these policy changes had ramifications to custodial staff yet did not show up on the district agenda. They were implemented without board approval. Mr. Meyer stated that according to AB 1611 (which amends a section to 3542.3), “Government shall provide prior written notice.” Meyer stated the CSEA had not been given notice and allowed mandatory negotiations related to such a policy change. This is in violation of the law. The next speaker addressed a misunderstanding communicated earlier in the meeting which resulted in an outburst from the audience. Dr. Amy Chen, CVUSD school board candidate, expressed that earlier that there was a misunderstanding communicated by Conejo Council PTA President, Rocky Capobianco. Chen stated that Capobianco’s certified letters were never received by her and so she was not able to RSVP by September 1. In an abrupt response from his chair, Capobianco shouted, “it was sent to you!” Chen replied, “Check with the post office because I didn’t get it and I haven’t signed anything,” to which Capobianco waved his hand. Chen then turned back towards the CVUSD board and stated she was interested in participating and if he were to send her the letter, she would be happy to come. 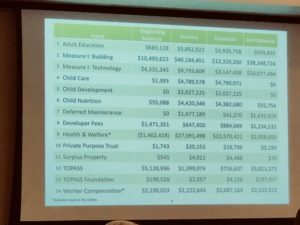 Chen then went on to address agenda items, specifically the $44M consent agenda. 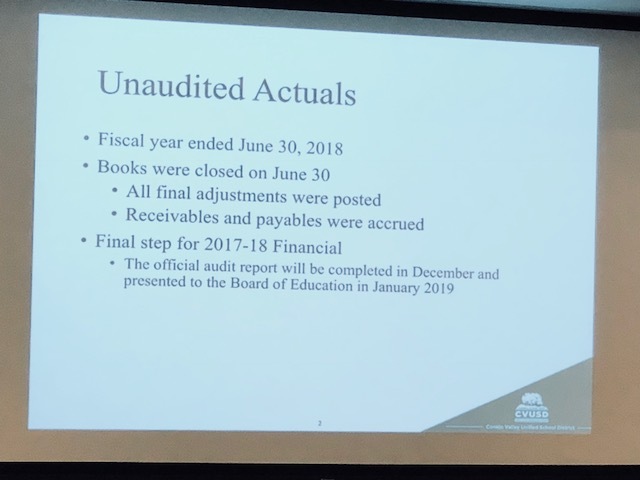 Chen stated that “Just because the board has “always done it this way does not mean the Board should continue this way” referring to comments from Trustee Pat Phelps at the previous meeting when she questioned Everett’s interest in going through each line item on the consent agenda list. 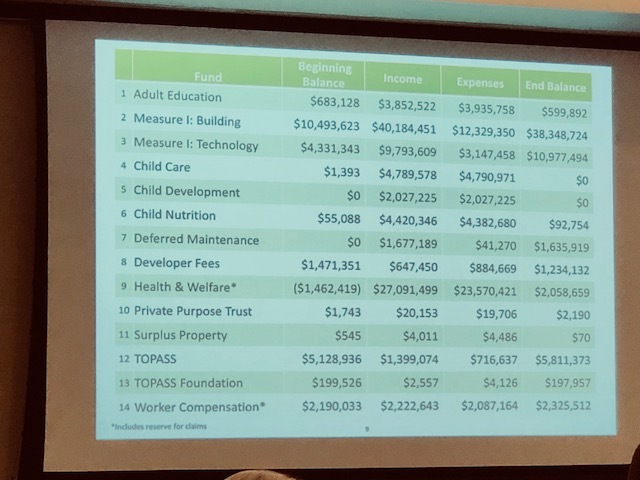 Chen then stated that a district with a $185 million budget and $197 million bond deserves a board that will ask more questions because decreasing enrollment threatens schools and the ability for the District to keep neighborhood schools open. The final speaker was Leslie Kay, who also addressed the letter sent by Dr. Connolly and her comments at the August board meeting about divisiveness on the board and in the community. After public comments, board members began to share their public comments. Connelly began by stating she did not want to use her period to rehash things. However, she defended her right to promote individuals in the community whom she felt would be well qualified to serve and stated other members on the board were also endorsing candidates. Connolly also addressed comments about her using a picture with Jacqui Irwin and students in a classroom setting and said it was totally appropriate as it was not at a CVUSD school and the families for the students had signed consent forms. Finally, Connolly addressed the new bullying policy and referenced the unfortunate incident with the Conti’s where the student told what happened to a teacher and told the teacher not to tell anyone. (NOTE: Public accounts of the Conti story differ from this). Agenda Item 4.A was related to intradistrict open enrollment where a discussion included a review of the many local schools student using “School Choice” to transfer to preferred schools. It was discussed that Lang Ranch is a difficult school to get into and Acacia, a new Magnate, is available and a strong option for families looking for an available magnate. Enrollment is at 308 and can go up to ~480. The district continues to try and let families know of other options. 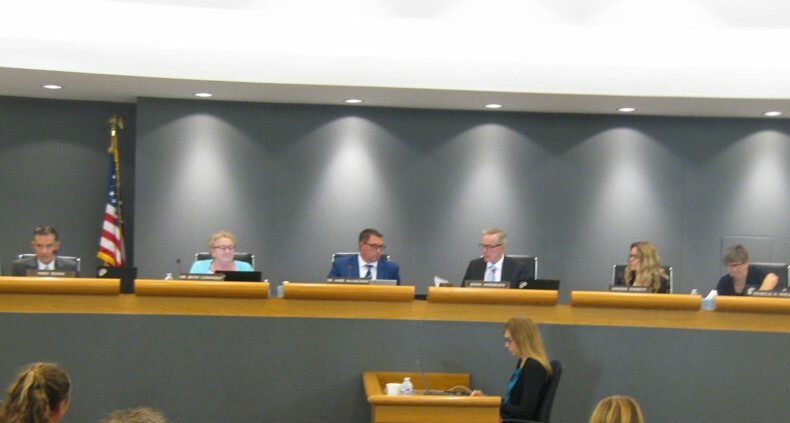 A vote was taken and passed 5-0 to approve the amendments to Board Policy and Administrative Regulations 5116.1 which included the process for “School Choice” at CVUSD along with the deadline of January 31 and the priority by which applications will be evaluated. The next agenda item addressed an expansion of Title IX to include discrimination based on immigration status, pregnancy or genetic information. The amendment passed 5-0. Agenda Item 5 A is related to the Gann Appropriation Limit for 2018 / 2019. Board Members adopted the resolution 5-0. Discussion on what the unaudited financials say. 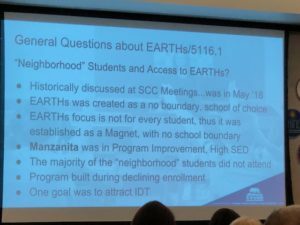 Information shared with the public and the Board including the following slides. 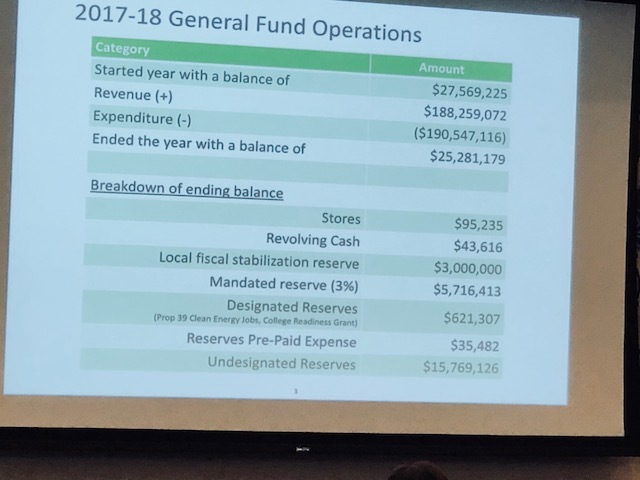 In discussion and review of the budget and the 2017-2018 Unaudited Financials, board member Sandee Everett asked why reserves were getting lower and the impact of the reduction over times. Hayek responded that on present trajectory the District could be at $0 reserves in 3 to 5 years due to diminishing enrollment which was averaged at 200-300 students lost per year. The remainder of the meeting was a review of bylaws changes and then an adjournment right after many items were shifted off for another day. September 26, 2018 Angela Nardone #1 Local, Popular, Thousand Oaks Comments Off on Candidate Forums: Bias or Balance?